Box02 – standard Puthon Collection “Vitra” box, with “1929” handwritten on the front cover. Nothing particularly special about the box itself, besides the year marking. What is exciting is that the box does, in fact, contain 11 slides all marked as 1929 images – so here’s hoping that there’s some chronology to the set in general (although I doubt that the boxes are in any kind of order). There seem to be at least a couple of trips pictured, and several new locations added to the map; a previously-seen location appears as well. The slides are, unfortunately, in slightly worse condition when compared to those from the first box – though the photography seems to have improved in general. Again, the action seems to be centered around Chamonix, which jives with the fact that several of the boxes have “Chamonix” written in masking tape on the side. Let’s take a look! Puthon is a local name. Found it in a republished 19th century list of Savoy surnames. There is still a Puthon family running a chalet to rent in the village of Taninges, which is not far from Chamonix. This village seems to be where they have been established for a couple of centuries. So, no matter what else we discover moving forward, it seems very likely that this is indeed a collection created by a member of the Puthon family – local to the region! We’ll get to this further in the Discussion section. Description: A view of four women in Le Lavancher – one of them Mme Puthon! – standing against a hilly backdrop, with a number of mountains in the distance. Box01-S06 also notes the presence of Léontine with Mme Puthon – so two of these women appear in two of the shots! We’ll get to this later, when we hit the “Discussion” section. But meanwhile, we have what basically appears to be a hastily-taken snapshot, based on what first looked like a printing error (but I later noticed was clearly something in the foreground) at top. 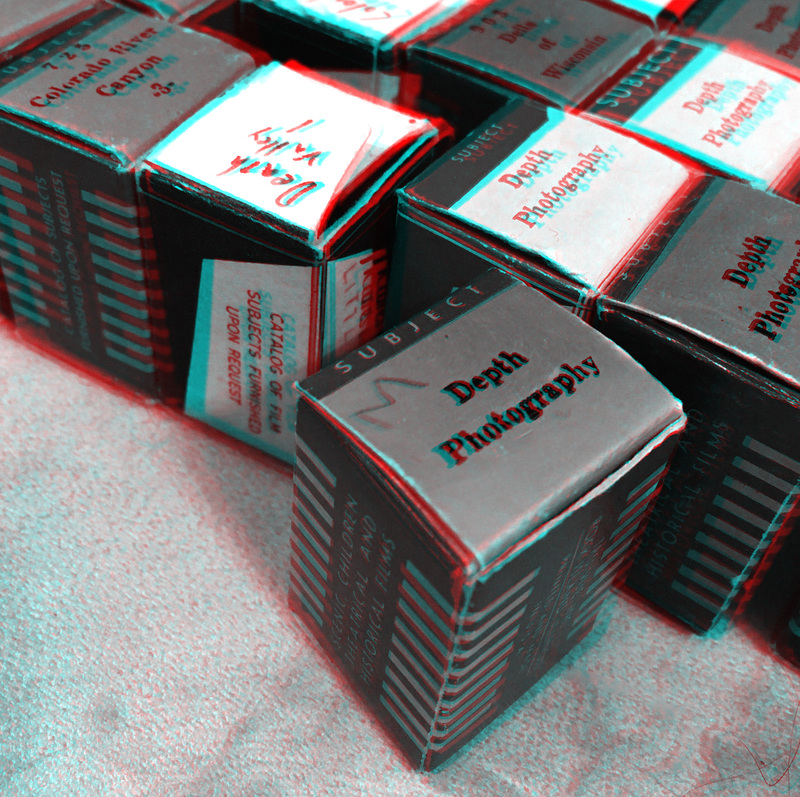 Technical: A pretty-much-straight-up-B&W image, this displays much better use of stereoscopy than most of the 1928 images from the first box, if somewhat dodgy composition. The bar / pipe / whatever it is at the top of the frame is distracting, and while the women are placed in a nice rule-of-thirdsy sort of position, they’re somewhat obscured by the background and the rather poor lighting. Nevertheless, it’s not a bad amateur shot. Females get an “F” designation, males an “M”, and the unknown gets the wildcard “?”. 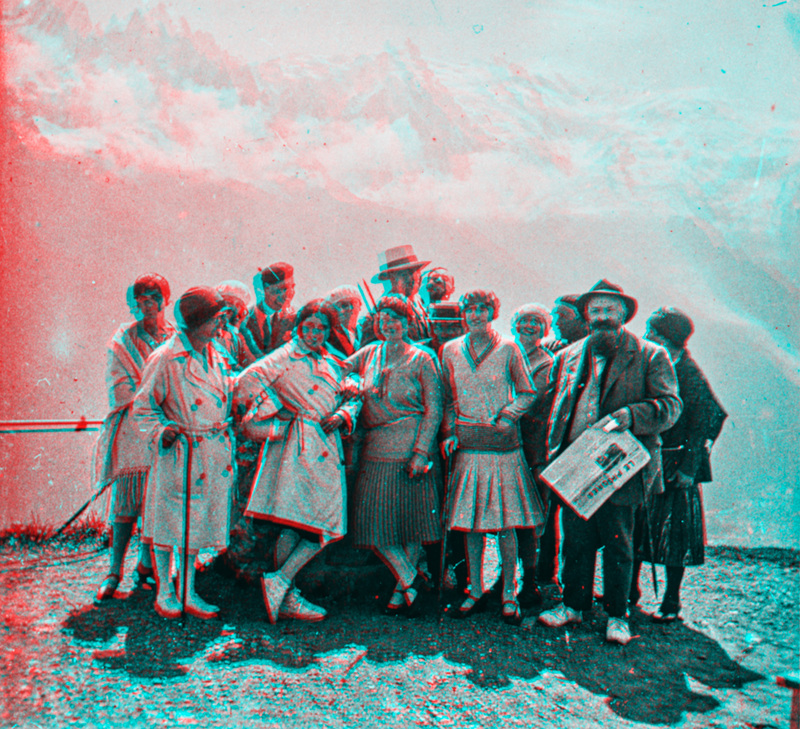 Description: Some people stand near the edge of the La Flégère summit around the time of the above image; this was either taken candidly or the subjects were posing in such a way as to appear casual. In the foreground, a weathered post sticks up from the ground; in the background, the grand mountains once again. The nearest woman is F2 from our chart above – the only woman wearing a white coat and a hat. Two of the three ladies with white hats (F3/F5/F8) are sitting with M1 on the ground. I can’t discern who the woman in the striped shawl is – can you? The final woman is either F9 or ?. 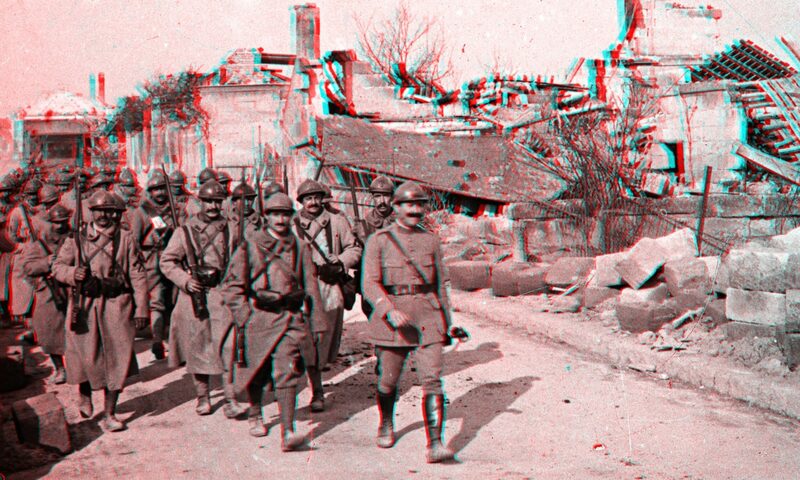 Technical: A pretty good stereo photo; the rusticated post in the foreground lends a wonderful 3D effect, while the figures certainly pops. The deep blue is pleasing, though again, one wonders whether there is any creator intention here. The composition is rather muddled – the photographer did not spend the time in framing with this one, but perhaps they were trying to just capture the moment. Sadly, the slide itself has a large tear in the emulsion of the right-hand panel. Description: Next to the side of a building, eight figures crowd around a makeshift picnic table and a circular table up on Brévent with chairs; upon the long table sits a telescope. The view of Mont Blanc is quite stunning and painterly in the background. Sitting at the table are all three of the White Hat Women (F3/F5/F8), and it appears like F4 is sitting there as well. The standing man might well be M1 with his hat and tie missing. It’s possible that these were taken on a single ambitious day of hiking, but absolutely not certain. Technical: This is another quite excellent stereo slide. While a bit contrasty, this probably couldn’t be helped – with the sky appearing clear, it might have been a while before a cloud could come and diffuse the light. The image is extremely well composed, and really shows off the scale of the mountains in the distance. Very pleasing to look at, and nicely sepia toned. 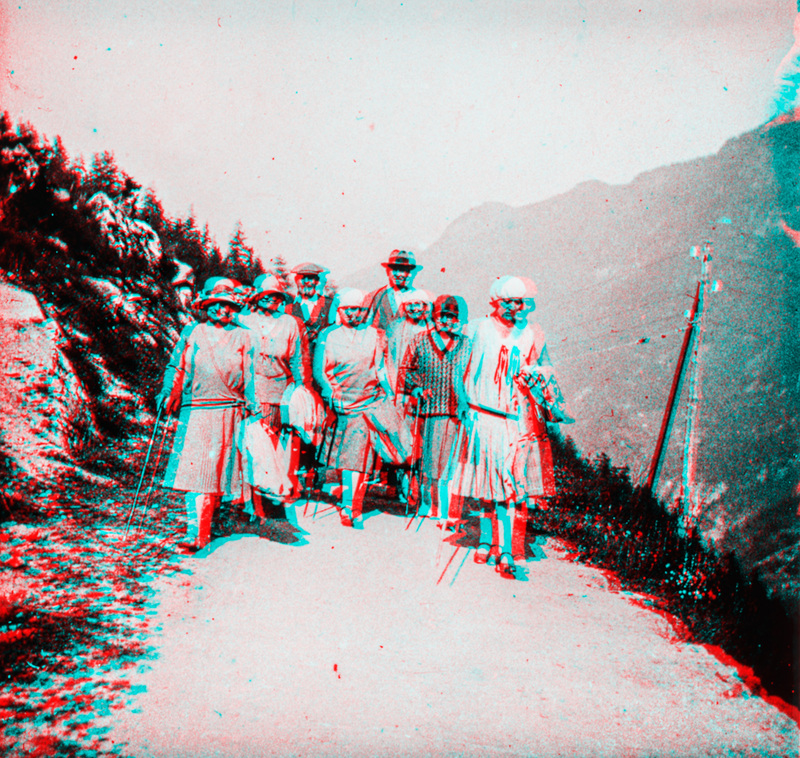 Description: A group of 9 figures walks along a path, presumably on the way back from Salvan. This doesn’t look entirely like the group from S02; while there are three women with white mushroom hats (seemingly a common 1929 fashion trend in the Alpine region), they don’t appear to be dressed exactly as the women in S02, and there are numerous other figures that might be new as well – particularly the bloke with the well-manicured salt-and-pepper beard in the background: it’s Posturing Gentleman from Box 1 again! The tall gent looks a lot like M2, and it’s likely that some of the group is the same. But Salvan is quite a hike from the Brévent / La Flégère region, so I’ll assume this was a different excursion. 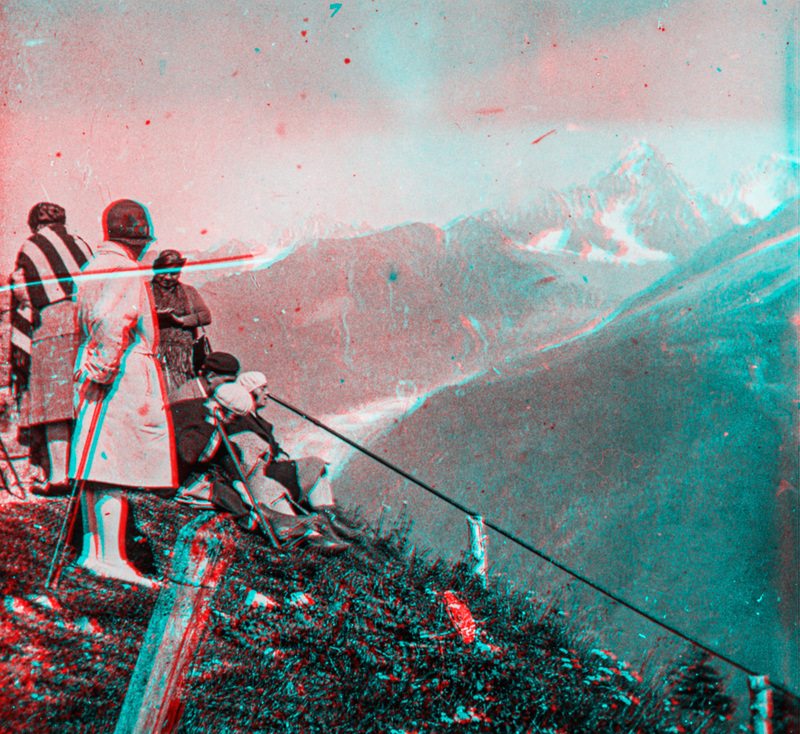 Technical: Neither a great stereographic image nor a poor one, these seems like a pretty standard “group walking along a path through the mountains” view. The image is far more contrasty than others, leading me to wonder whether it was developed separately. It’s got decent stereo, and pretty standard composition – overall, it’s competent, not impressive. Description: Another view from Le Lavancher, this time with a horse! Posturing Gentleman is here again, as is the woman on the far right in S01 – here, in front atop the horse. The woman second from the right in S01 is here too, standing in profile to the camera and reaching toward the horse. The woman pictured here with her back to the camera could well be the second from the left in S01 – meaning that the leftmost woman in S01 is the only person not appearing here. The other woman atop the horse, with the elaborate hat and the shadowed face? No idea. Finally, the metal frame behind the horse could well be the thing hanging into frame in S01 – though this is just conjecture. Technical: This is well done image. 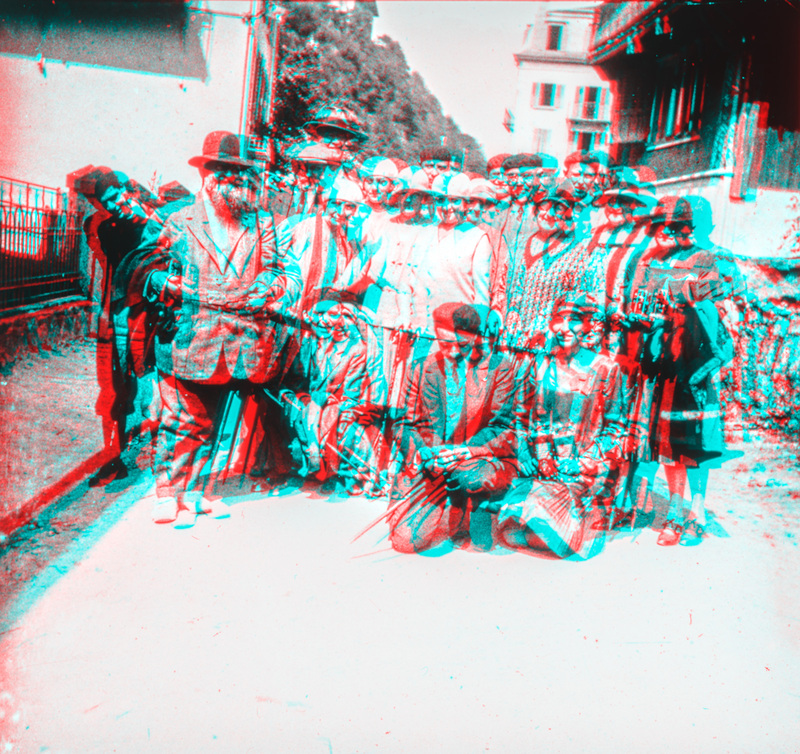 The stereography is compelling, and the composition is going, showing motion and action – unlike most of the images by this photographer. The mountains, and the buildings in the valley between the mountains, frame the scene wonderfully, and the lighting is impeccable. Description: This must have been taken on the same trip as Box01-S10 – it’s similarly toned, and showing buildings in Salvan along with some common figures, including Posturing Gentleman for the third time in a row! 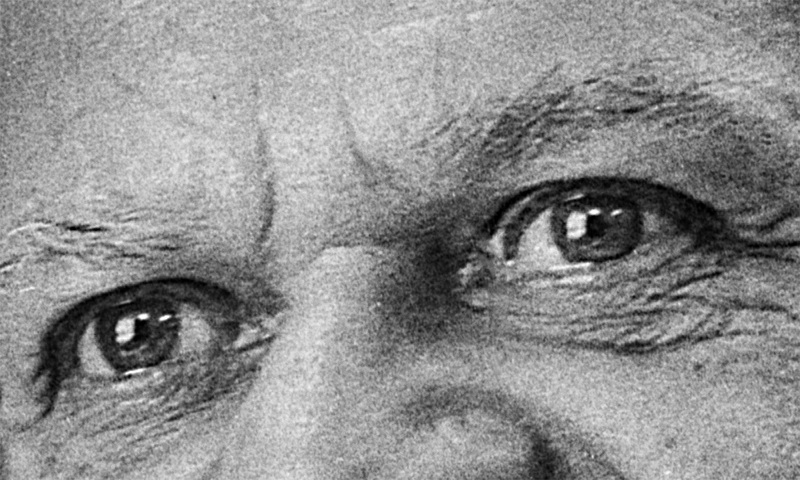 So he’s now showing up all over the place in 1928 as well as in 1929 – I’m getting the feeling that he’s a regular with this photographer’s crew. Not sure who “the Americans” referenced on this slide and Box01-S10 might be. Nobody else is readily identifiable, at least at a first glance. Technical: This is okay, but not great; the lighting is harsh, and a huge swath of the image is taken up with… white space. This can work to focus attention, but in this case, my attention is drawn more to the buildings, and to trying to figure out whether the nearby passerby in silhouette is carrying a camera. 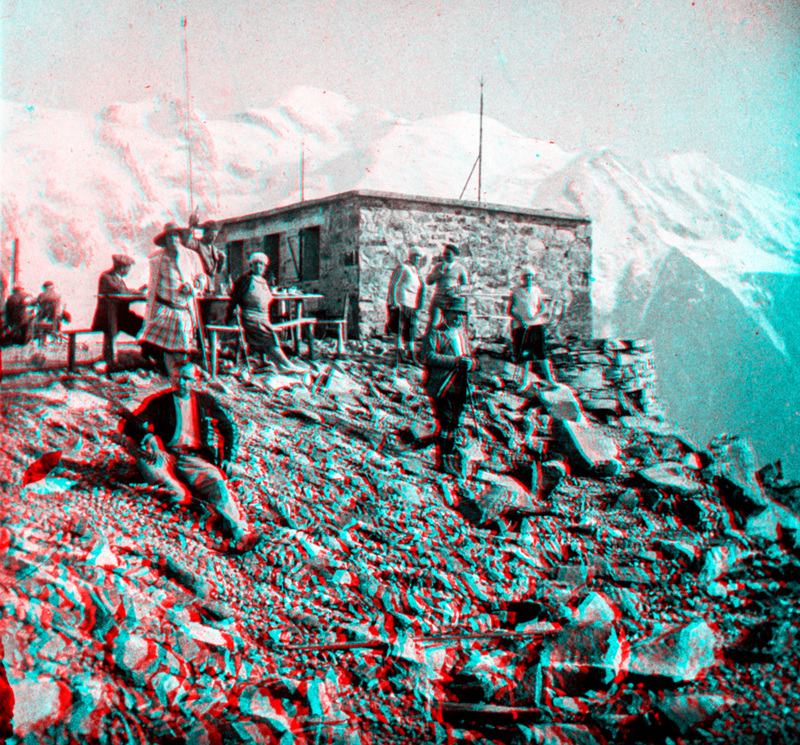 The stereo effect is underwhelming due to the subjects being far away and the foreground being boring – not among this box’s more impressive shots. Description: A group of people climbing a natural chimney somewhere in the Brévent area, aided by some metal railing that have been affixed to the stone. Three of the White Mushroom Hat Ladies are here, as well as some other figures, none immediately recognizable. 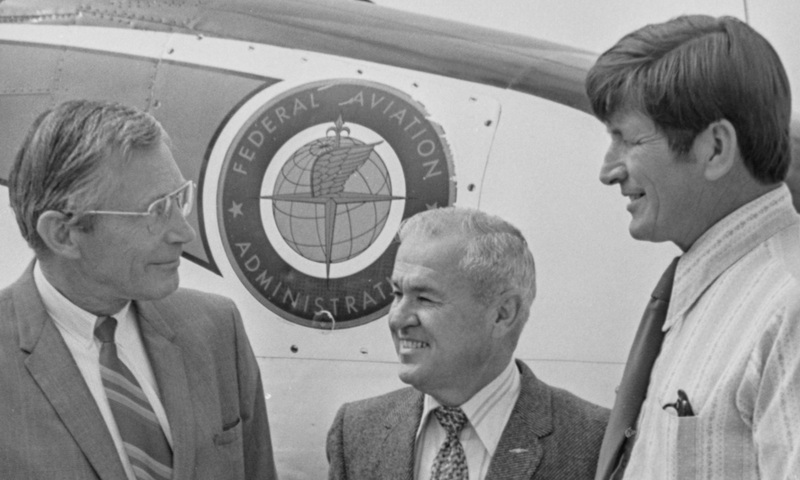 Two of the men are wearing circular sunglasses. The angle of the shot makes the climb look somewhat intense, but the relaxed postures of the subjects betrays this notion; there’s no way that this is a tough climb. Description: Nine people have made their way – or are making their way – to a rocky outcropping near the Brévent summit. 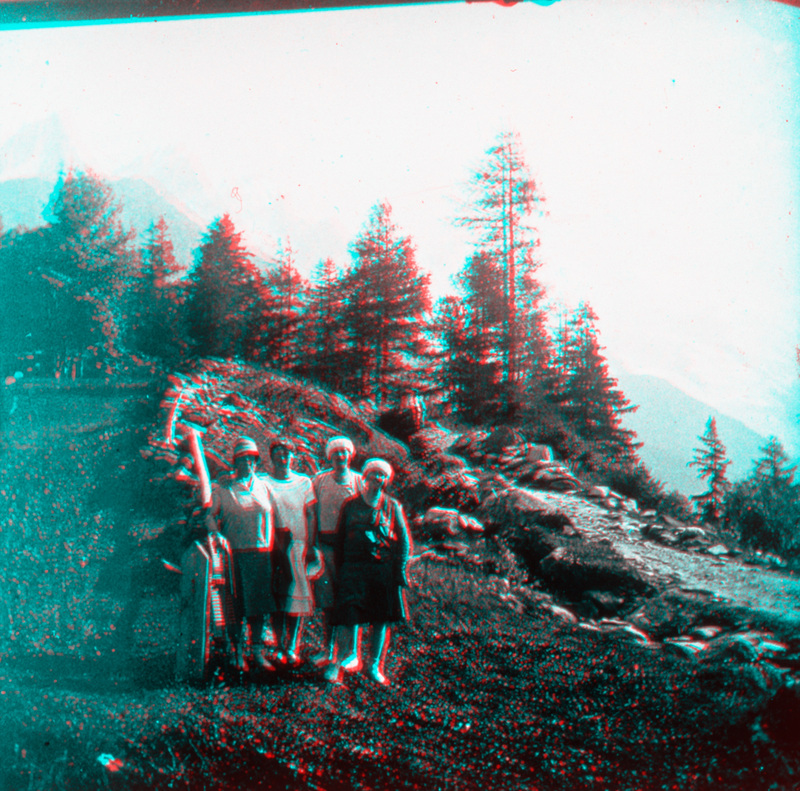 They’re quite small in frame, so it’s hard to tell exactly, but it looks like a group from which the subset in the above stereoview was culled. These were likely taken on the same trip. The man touching the brim of his hat certainly resembles M2. Technical: This is a stunning image, second only to S02 in this set in terms of image quality. The haze once again allows a wonderful separation between the midground and background; there really is no foreground to speak of, due to the distance between the lenses and the subjects. The mountaineers are well placed, both in places where they stand out and in places where one has to search for them, adding an element of mystery to the scene. I just wish there weren’t an emulsion lift on the right panel! Description: A group of people, including the Posturing Gentleman, are clearly posing for a photograph in the streets of Salvan. There appears to be a camera club of some sort in the photo: new arrivals (for us) include an elegantly dressed woman with a folding camera, kneeling, bellows extended; a gentleman with a large brick of a camera at his side; an older woman with a box camera standing. M2 is there in the background as well. Technical: Ack! There is severe right tilting to the camera here, resulting in a distractingly angled final image. 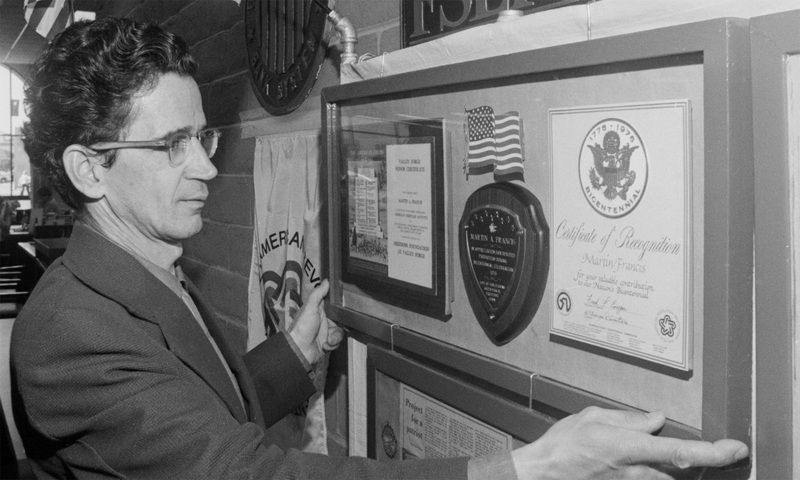 Unlike a regular photograph, to which a mat can be applied to make a crooked image look straight, this format does not allow for such. This was either an outtake or a mistake on the photographer’s part; the extreme angle is so distracting that it significantly detracts from the image. Description: A group of travelers – many of them the same as in the other Brévant and La Flégère images in this box, as well as some that are definitely from Box 1. In the far distance, the mountains; in the foreground, coarse rocks. M1 is here, as is Posturing Gentleman. The three White Mushroom Hat Ladies are here again, and I’m becoming convinced that the older-looking Mushroom Hat is Diagonal Top Lady from Box 1. But we’ll see in the end discussion what we’re able to sort out. Technical: Very good indeed. 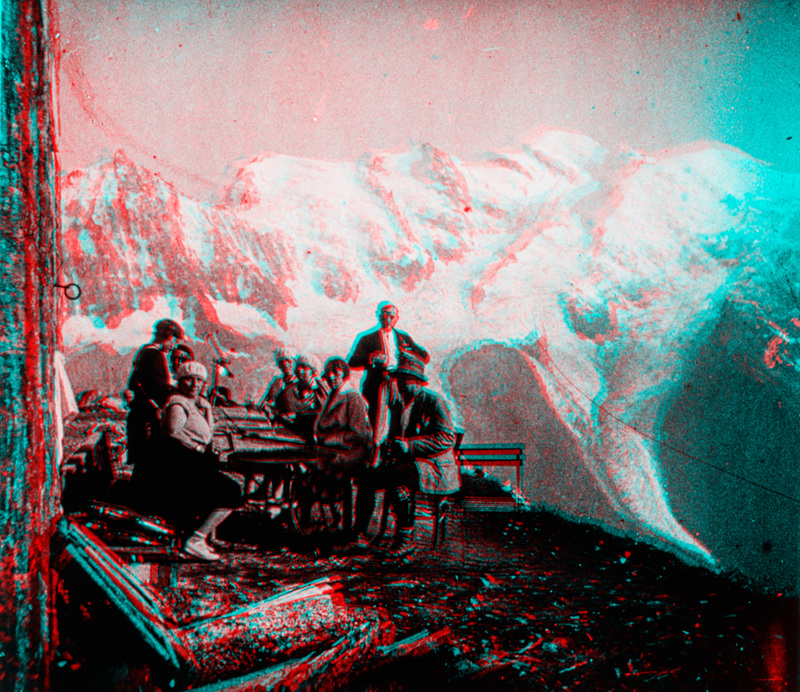 Once again, contrast is used to good effect to highlight the Chalet, the mountains, and of course, the subjects. 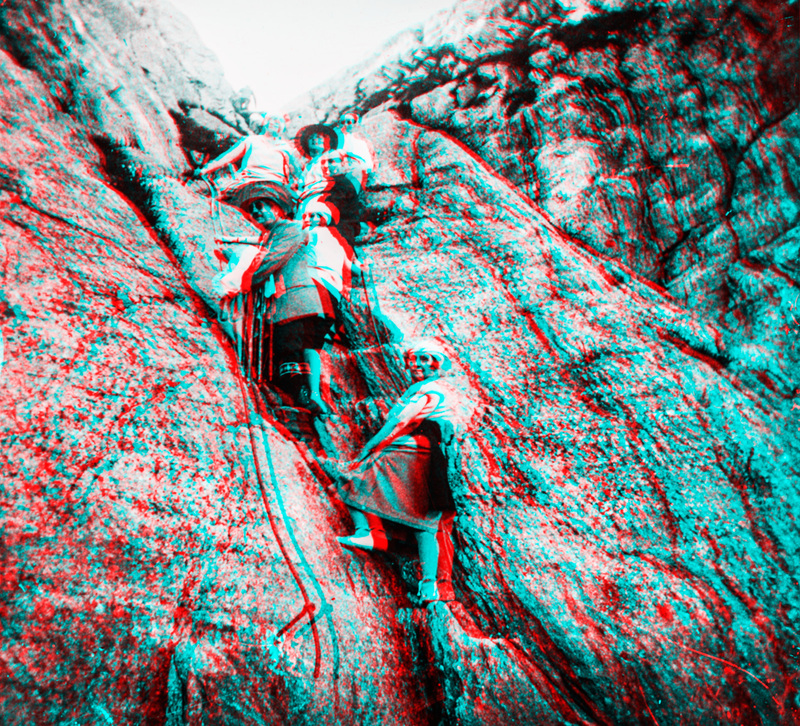 The boulders in the near foreground really help give layering to the stereographic merge. The entire scene is beautifully framed by the mountains, and even the bright lighting does not detract in this case. Sadly, artifacts on the slide are distracting, and little can be done about that. Detail from Box02-S01. For now, from left to right, we’ll call them “A”, “B”, C”, and “D”. The three ladies from the previous post. From left to right: “Familiar Lady”, “Flower Dress Lady”, and “Diagonal Top Lady”. This view bears quite a resemblance to “Diagonal Top Lady” from Box 1. 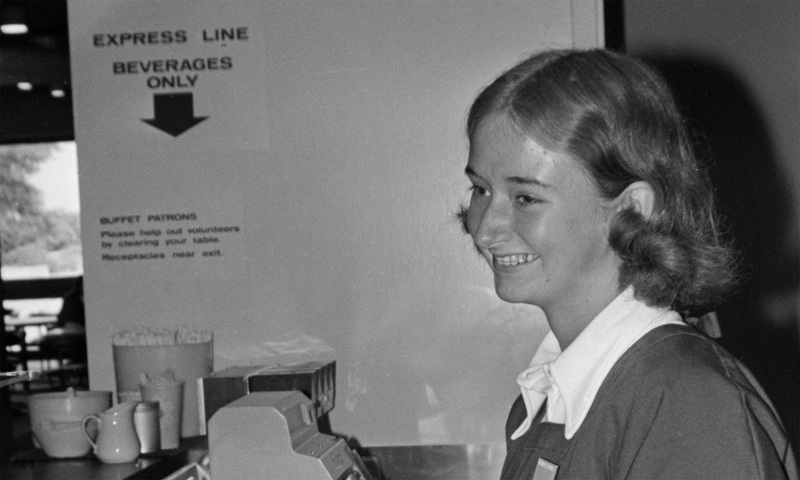 There’s the superficial similarity of the White Mushroom Hat, of course – but then, those seemed to be “the thing” in those days, and they’re hardly unique. However, her facial structure – roundish face, large nose – are similar, and she has a similar general build. Of course, if the two images are indeed of the same person, that means little – it could be Léontine, Mme Puthon, or someone else entirely. Then there’s the left-frame ladies of each side – “A” and Familiar Lady. Similar hats, similar builds, even similar expressions. But as of now, it’s hard to say – and we’ll leave such questions until we have yet more evidence. At the very least, we now know that we have at least several images of Mme Puthon in any case, based on the Box 1 comparisons, and very likely at least 2 in this box as well. The photographer themselves – M Puthon or otherwise – was at least a semi-skilled climber. In order to balance from whatever his position was when taking S09, as well as to schlep his camera, plates, potentially extra backs, etc along on the more rugged routes, the photographer would have to be a physically sound specimen. 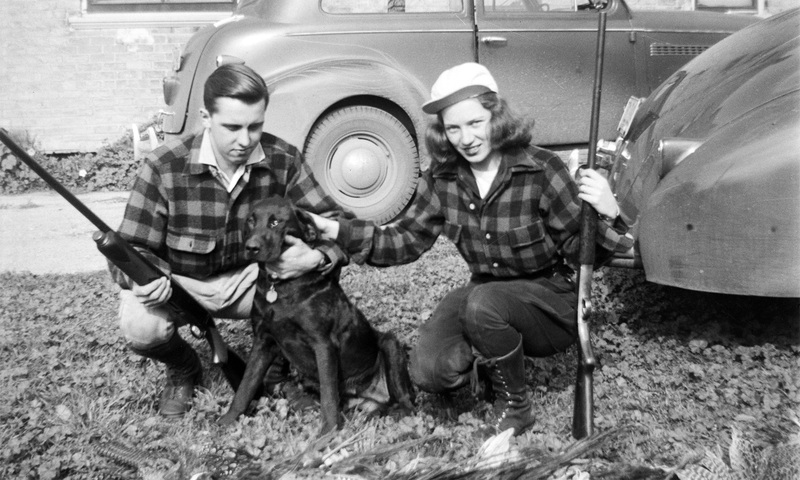 The photographer regularly took at least one, and likely more than one, of the same people with them on their excursions. At the very least, Posturing Gentleman has now appeared in two different years at most every location photographed in this collection so far. The Puthons were a wealthy family from the Chamonix region, and simply galavanted around with other wealthy people. 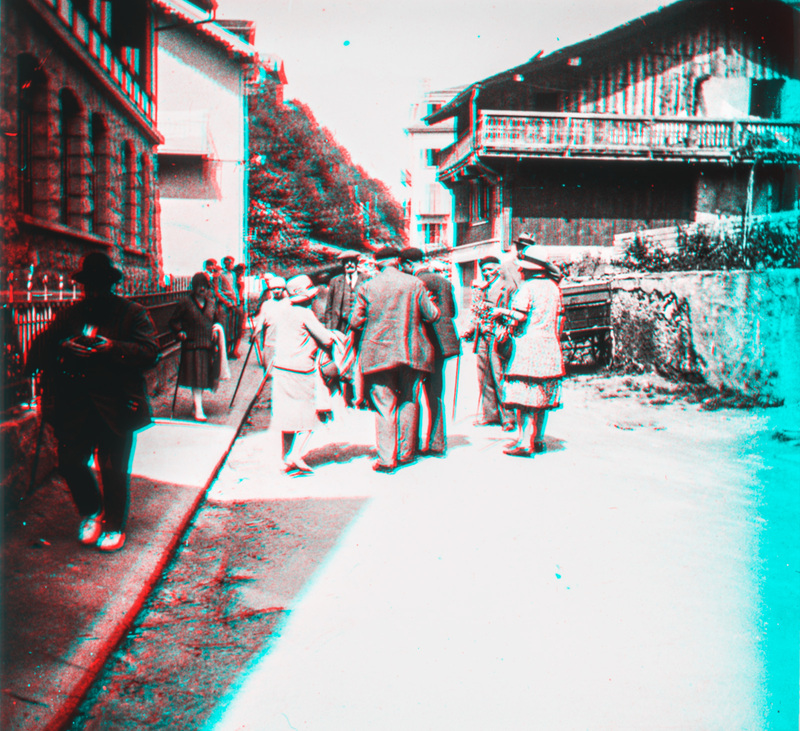 This is further supported by the “hanging out with Americans” images from Salvan, where the newcomers indeed looked wealthy; by the fact that some people are consistent between 1928 and 1929; by the fact that the stereoviews are all still from one particular geographic region. On the other hand, it’s somewhat put in doubt by the fact that these all appear to be summer images – if they resided in the area, why no winter photos? Of course, we’re only 22 slides into the set, so we’ve a long road ahead! The Puthons were indeed a married couple, possibly wealthy, and M Puthon practiced photography as they traveled all over the world. This is explained equally well by the same evidence we’ve added to possibility 1, without the problematic lack of winter imagery in the collection as it stands so far. However, unless they traveled the world with the same group of people, why would figures like Posturing Man appear in a majority of images? The Puthons were a family that ran an inn, or a travel agency, or another sort of tourism business. 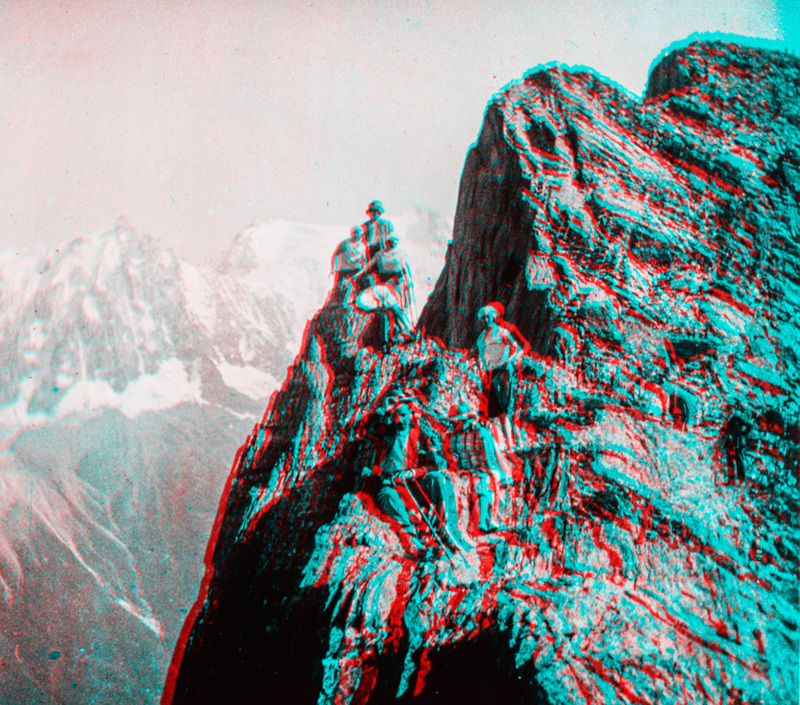 M Puthon found a side business in selling stereoviews to tourists – he could take the diapositives while he led various expeditions, and the Puthon Collection represents his collected rejects or un-purchased views. This is seeming less likely, as (1) if he was a local tourguide, why would be bring the same friends on every trip? and (2) some of the “rejects” – particularly slides like S02 and S09 – are so good that they could easily be sold even to uninvolved parties – they’re just good photography overall. I’m not getting this feeling as of yet from the images. Interesting to fit these photos in with the opening of the cable cars, because the ladies do not look as though they walked up. The first half of the two stage one to the top of the Brevent opened on 30 July 1928 (Planpraz). The one from there to the top opened on 7 September 1930. I tend to prefer the idea of a group of local bourgeois + hangers-on going on regular Sunday outings, with M. Puthon dragging along his fancy camera to immortalize the fun. It seems as if Option 1 looks the most likely, and until anything points to a different scenario, I think it best to proceed under the assumption that this is some version of the actuality. And again, this is where you come in! If you recognize a location, or notice something I didn’t in terms of matching people up – LET ME KNOW! Use the Contact page, or leave a public comment below. It’ll be added to the discussion here, and you’ll be credited! 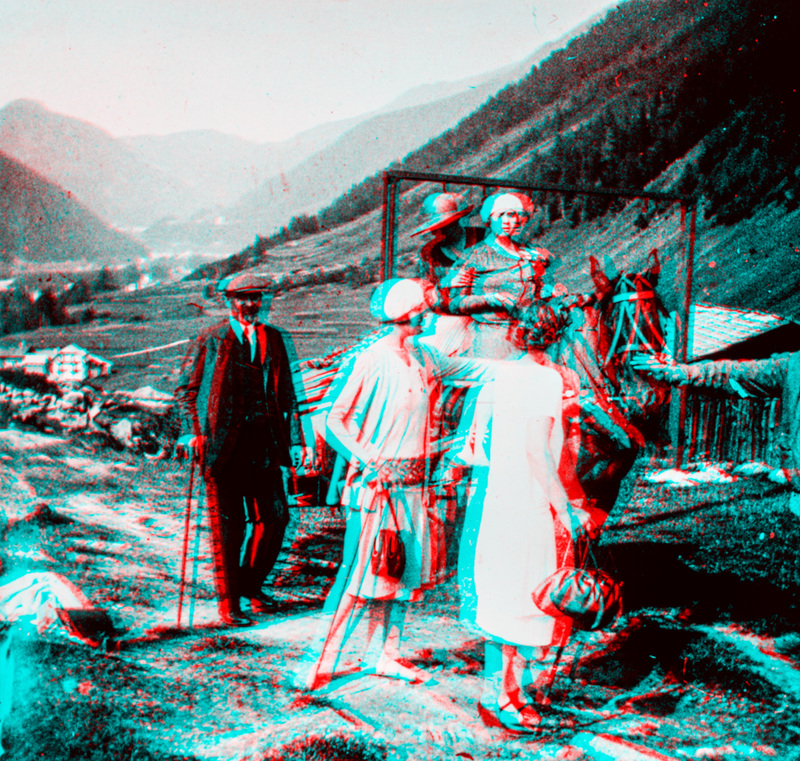 Even if you have some little alternative theory that you’re mulling, you now have 22 stereoviews at your disposal. Do some digging, and let us know – I’m not going to solve everything I want to about these slides on my own; I don’t know the region, the culture, what it looks like now – hell, I don’t even speak the language. So please lend a hand where you can! 1) You can find the exact spot “Cheminée du Brevent” (the Brevent chimney) by simply Googling that and checking out the images. Seems to have been a popular tourist scramble, with lots of postcards. 2) Puthon is a local name. Found it in a republished 19th century list of Savoy surnames. There is still a Puthon family running a chalet to rent in the village of Taninges, which is not far from Chamonix. This village seems to be where they have been established for a couple of centuries. Thank you so much for your interesting and incredibly helpful commentary on both this and the Box 1 post! I’m going to add some of your thoughts to the post proper. Merci beaucoup!